The countdown to launch creeps closer and there’s still plenty for self-taught rocket scientist “Mad” Mike Hughes to do: Last-second modifications to his vessel. Pick up his flight suit. Leave enough food for his four cats — just in case anything happens. Hughes is a 61-year-old limo driver who’s spent the last few years building a steam-powered rocket out of salvage parts in his garage. His project has cost him $20,000, which includes Rust-Oleum paint to fancy it up and a motor home he bought on Craig’s List that he converted into a ramp. His first test of the rocket will also be the launch date — Saturday , when he straps into his homemade contraption and attempts to hurtle over the ghost town of Amboy, California. He will travel about a mile at a speed of roughly 500 mph. “If you’re not scared to death, you’re an idiot,” Hughes said . “It’s scary as hell, but none of us are getting out of this world alive. I like to do extraordinary things that no one else can do, and no one in the history of mankind has designed, built and launched himself in his own rocket. The daredevil/limo driver has been called a little bit of everything over his career — eccentric, quirky, foolhardy. Doesn’t bother him. He believes what he believes, including that the Earth is flat. He knows this thought is a conundrum, given that he’s about to launch himself into the atmosphere. Down the road, he’s intending to build a rocket that takes him to space, so he can snap a picture and see with his own eyes. This will actually be the second time he’s constructed and launched a rocket. He jumped on a private property in Winkelman, Arizona, on Jan. 30, 2014 , and traveled 1,374 feet. He collapsed after that landing — the G-forces taking a toll — and needed three days to recover. That distance, though, would’ve been enough to clear the Snake River Canyon, which is a jump daredevil Evel Knievel made famous when he failed to clear it during his attempt in 1974. Stuntman Eddie Braun did successfully zoom over the canyon — using Knievel’s original blueprints — in September 2016. Just don’t mention Knievel around Hughes. He’s not a fan. 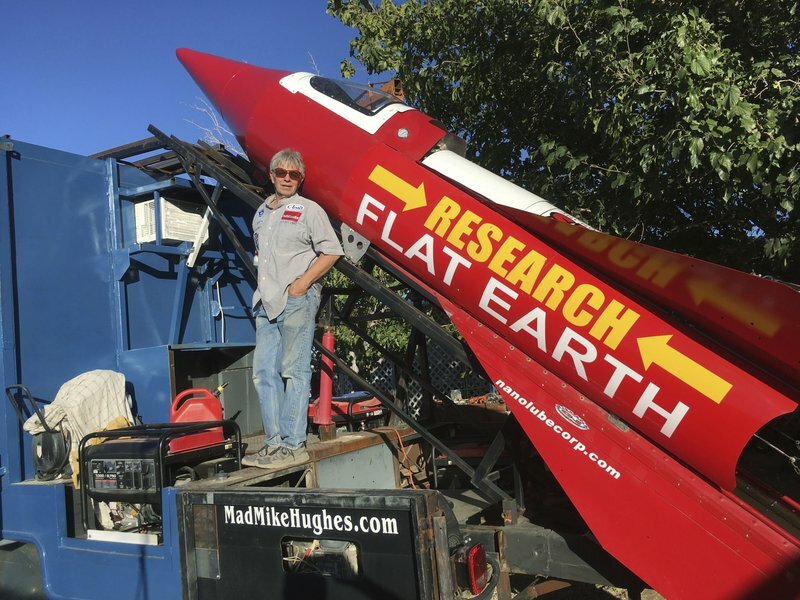 Hughes constructed his latest rocket at the “Rocket Ranch” in Apple Valley, California. It’s a five-acre property he leases from Waldo Stakes , the CEO of Land Speed Research Vehicles who’s currently working on a project to make a car travel 2,000 mph. Their relationship formed a few years ago when Hughes approached Stakes about building a rocket. Stakes receives plenty of these sorts of requests, but this one stood out because Hughes was building it himself. Here’s the thing: Hughes doesn’t make all that much money — $15 per hour as a limo driver, plus tips. That’s why he’s scrounged for parts, finding the aluminum for his rocket in metal shops and constructing the rocket nozzle out of an aircraft air filter. He gave it a good varnish of cheap paint, and his launch pad is attached to a motor home he bought for $1,500. “I want to inspire others — and you have to do something incredible to get anybody’s attention,” Hughes said. The location of the jump will be Amboy , a ghost town l in the Mojave Desert and along historic Route 66. The fictional town of Radiator Springs in the Disney movie “Cars” was loosely based on Amboy. Hughes got permission from the town’s owner, Albert Okura, who purchased the rights to Amboy in 2005 for $435,000. The launch will take place on an air strip next to a dilapidated hangar. On the morning of the launch, Hughes will heat about 70 gallons of water in a stainless steel tank and then blast off between 2 p.m. and 3 p.m. He plans to go about a mile — reaching an altitude of about 1,800 feet — before pulling two parachutes. They’re discouraging fans — safety issues — but it will be televised on his YouTube channel . He said he’s been in contact with the Federal Aviation Administration and the Bureau of Land Management. Following his jump, he said he’s going to announce his plans to leap into the race for governor of California. His future plans include an excursion into space. He and Stakes have already brain-stormed on a “Rockoon,” which is a rocket that, rather than being immediately ignited while on the ground, is carried into the atmosphere by a gas-filled balloon, then separated from the balloon and lit. This rocket will take Hughes about 68 miles up. First things first — this jump over a ghost town. He will be tinkering with his rocket right up to takeoff. Last edited by bucfanclw on Mon Nov 20, 2017 12:08 pm, edited 1 time in total. A 2,000 mph car? Where are you going to go with it? What are you driving on? Kress wrote: A 2,000 mph car? Where are you going to go with it? What are you driving on? The answer to all 3 of those questions is "Merica". Does it have flame throwers for offense and Bat Man style anti-shark spray for defense? If so, I'm all in. Then again, Phelps can apparently come close to out-swimmimg a shark, so at 2,000 mph we're probably good. Just mount the flame throwers. I hope beardmcdoug makes it through this alive. Terry and mbm will use the results as proof. They're still trying to figure out what it's proof of, but if they string together enough random words they're sure it will make sense. Needed to post the pic too. It really sells the story. Buc2 wrote: Needed to post the pic too. It really sells the story. But it also presents the question; why is there a corporation built to lube up nano? No. It doesn't look like there is a passenger seat there. This photo is Bootz-worthy proof that he'd have to be in the back. For the first time ever we can assume you're UNDER-estimating the size of your rocket. I can't tell if it's ironic that Research Flat Earth is his primary sponsor. Do the Darwin Awards still exist? I have much respect for anybody willing to think outside the box and stand up for what they believe in. No matter how dumb they are I salute them. Ironically, with as many goofy scientific and conspiracy theories as there are the Law of Averages says that a least a few are correct. I doubt the flat Earth is one of them, but there are bound to be a few. Sammich wrote: I have much respect for anybody willing to think outside the box and stand up for what they believe in. No matter how dumb they are I salute them. I don't know how much he really believes in his position. This whole thing smacks more of attention whoring than anything else. **** or get off the pot. You doubt flat earth is one of them? And, of course, we had a failure to launch. Got up to 350mph and 1,875 feet before crashing 1,500 feet away from the launch pad. He survived. No word on flat earth confirmation. Mountaineer Buc wrote: Welp, he launched. I'm guessing, not, but your comment got me looking for the answer to when we can start seeing the earth's curvature with the naked eye. According to optical researchers, while we can fool ourselves into thinking we see the curvature of the Earth from high mountains, this is usually wishful thinking. Look there are two ways to see the curvature of Earth, either you go up or you go to a beach. 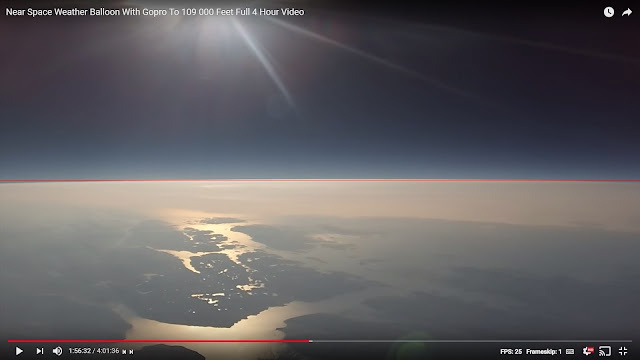 You should be able to detect it from an aeroplane at a cruising height of around 10,600 metres (35,000 feet), but you need a fairly wide field of view (ie 60 degrees) and a virtually cloud-free horizon. The reality is that clouds, hills and mountains mean we rarely get to see the kind of perfectly flat horizon where the curve would be most obvious. The true curvature of the earth would be the actual edge of the disk, a great circle of exactly the same diameter as the earth. What you can see from any airplane altitude is a horizon circling you at a few hundred miles away. A small circle. From 35,000' the horizon is about 230 nautical miles away. So 230nm is the radius of a small circle of the earth's surface that you can see. To see the actual curvature, which is vastly greater than this circle you would have to be able to see the entire earth. Actual earth-disk circumference is 21,600 nautical miles. Earth's surface disk visible from FL350 is about 1446 nautical miles. 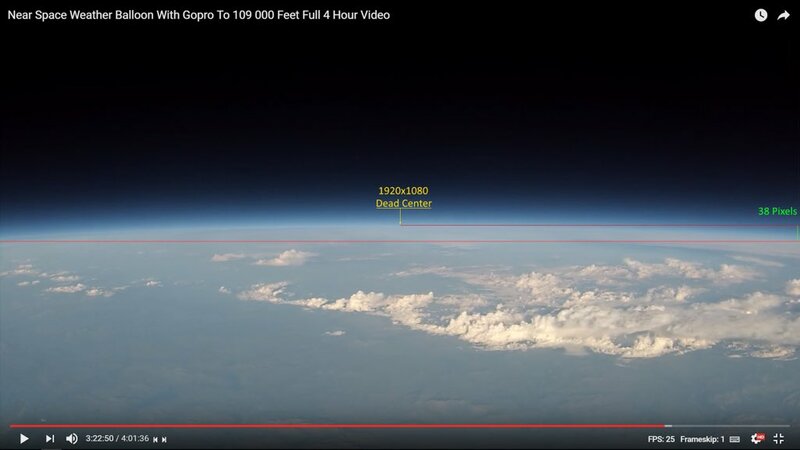 To claim you can see "the curvature of the earth" from low altitude, like a hundred thousand feet or so, is like putting your eye a couple of thousandths of an inch from a large beachball and believing that you can see its curvature. The math is about the same. What looks curved is that the horizon is about 230nm away at your twelve o'clock but it is also 230 nm away at your eleven, and your one, and your ten, and your two, and your nine, and your three, and so on. If you can see all the way around (as in, from the basket of a balloon) the effect sort of goes away and you again get the sense that you are just hanging above a big (possibly curved) surface. The line of the horizon curves all the way around you, so hanging above a circle it will look curved. Again, to see the true curvature, you'd have to be able to see the entire near side of the earth. However, you can detect the curve of the Earth from ground level at the coast with a pair of binoculars – just look for distant ships on the horizon and you’ll see that their hulls start to disappear before their masts and other superstructure. Ancient Greek scientists, who spotted this without any optical aids, used this to conclude that the Earth was round.